Only “bold reforms” in Yemen will meet the expectations of the country's people, Secretary-General Ban Ki-moon said today, urging authorities to immediately start as broad a dialogue as possible with the political opposition, youth groups and other elements of civil society. Yemeni President Ali Abdullah Saleh reportedly sacked his Cabinet today, two days after pro-Government forces shot dead as many as 50 unarmed civilians who had been protesting in the capital, Sana'a. But Mr. Ban, speaking to journalists in Cairo, Egypt, said he was not sure that sacking the Cabinet would be sufficient to address the concerns of the Yemeni people, who have been holding widespread protests for several weeks over the political, social and economic situation in the impoverished country. The Secretary-General and three independent United Nations human rights experts have already strongly condemned Friday's attack on peaceful protesters. 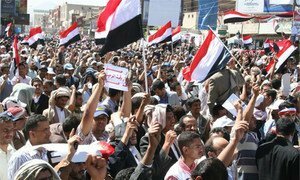 The unrest in Yemen is part of wider discontent in North Africa and the Middle East that has led to the toppling of long-standing regimes in Tunisia and Egypt since the start of the year, deadly conflict in Libya and ongoing protests in many other countries. Secretary-General Ban Ki-moon has strongly condemned today’s reported killing by Yemeni security forces of at least 33 people who had been participating in demonstrations in the capital, Sana’a.